The joys of having a roof over your head are nearly endless. When it rains, you stay dry. When it’s hot, you have shade. When there’s a plane soaring loudly in the sky, you have a barrier giving you peace and quiet. However, there comes a time when your roof has had enough. Nothing lasts forever and mobile home roofing is no exception. The joys of having a roof over your head are nearly endless. When it rains, you stay dry. When it’s hot, you have shade. When there’s a plane soaring loudly in the sky, you have a barrier giving you peace and quiet. However, there comes a time when your roof has had enough. Nothing lasts forever and mobile home roofing is no exception. The sun, wind, and rain and a concoction of nature’s other surprises will eventually huff and puff just enough to cause damage to your roof. When the time comes to replace your mobile home roof/ TPO (thermoplastic polyolefin), is the way to go. TPO is a roofing material that has had repeated success withstanding the elements. Not only is it cost-efficient compared to other roofing options, it is UV and heat resistant, energy efficient, durable, and it comes in various styles to suit the needs of the home and the homeowner. Find out why TPO is the number one commercial roofing material today and how is saves money on energy costs. TPO, the acronym for the full-length tongue twister is Thermoplastic Polyolefin, is a heat resistant blend of plastic, rubber, and filler material (usually composed of fiberglass, talc, etc.). This single-ply roofing material grew in popularity because it is reliable and long-lasting. Let’s glance over TPO’s history to see why it is one of the most sought-after roofing material to date and extremely popular for mobile home roofing. TPO started years after its predecessor PVC (polyvinyl chloride) in Europe during the 1970’s. PVC, best known for its versatility, is the third-most widely used plastic polymer blend in current times. Both TPO and PVC are thermoplastics, meaning they can transform and mold at a certain temperature but solidify once cooled off. PVC became the industry standard for contractors and commercial architects everywhere in the 1960’s when it was realized that the material could withstand chemical, light, and temperature corrosion. As science and technology advanced, so did the understanding of environmental hazards and the effects PVC has on the global effort to “Go Green”. PVC roofing membranes are made up of plasticizers which are substances used to improve the plasticity and strength of whichever material it is added to. At first, plasticizers were a positive thing. They gave PVC flexibility, but the long-term effects soon outweighed the short-term benefits. After many years, the plasticizers would break down and wash away. Not only does this process add hazardous chemicals to the soil, it weakens your roof and increases the risk of leakage ad cracking. TPO formulas over the years have corrected the problems PVC membranes have, and now the TPO material is near perfect with its plasticizer-free chemical structure. TPO doesn’t break down as easily as PVC and it is safer for the environment. Although TPO has a shorter history, the roofing material has gained popularity because it is just as moldable and durable as any unnecessary additives and the risks and problems PVC carries. Out with PVC; in with TPO! PVC is slowly becoming a roofing material of the past because it is an older and more expensive way to protect your home than TPO. TPO is now widely-used material for good reason; it’s a reasonably priced and dependable. TPO is also known for its environmental benefits. TPO is a light-colored, reflective material that bounces UV rays away from the home and leaves the inside of the house feeling cool and comfortable. Plasticizers in PVC attract mold and cause the once-lightly colored material to darken, reducing energy efficiency and absorption. You can worry less about your AC bill when a TPO roof is installed. Yes, exterior decoration is just as important interior decoration. Your roof should “fit in” with the rest of your home and still be an affordable, environmentally friendly, and energy efficient roofing option. White roofs are a sure sign of an energy-efficient home. Now, it doesn’t have to be that way. TPO roofs come in more than just one color to suit your preference. White, Light gray, tan and even reflective black are colors that can be used in TPO installation. With more color options available, you can make sure mobile home stays cool inside and out. Compared to the rest, TPO is the closest thing to a reliable roofing superhero. Not only does TPO fight mold growth, it deters tears, cracks, dirt, and punctures. It’s resilience to weather comes from its chemical structure. Plasticizers found in PVC roofs wither away with change in weather, causing the roof to shrink and crack. Depending on how serious the situation is, what could have been a patch job has now turned into a whole new roof installation. When it comes to deciding what material you can trust to put above your head, make TPO your top choice. It’s new and improved, tried and true and will save you money from the get-go. Now that you know a little more about the history of TP0, its energy efficiency, environmental effects, cost-efficiency, and overall durability, maybe you will accompany the many who are now enjoying the benefits of TPO roofing. 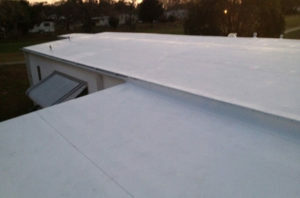 Contact TPO Membrane Roof Experts! Do you need a mobile home roof over? Does TPO sound like it might fit the bill? To learn more about TPO membrane roofing, and to see firsthand all the benefits it will provide your home, contact us online or at 1-800-297-3758. Our trusted customer service team is available 24 hours a day and will be happy to answer your questions and set an appointment for a free video roof inspection.